The page (fun) doesn't exist. You have been redirected automatically to the start page of the namespace. We must know the present need of human society. And what is that need? Human society is no longer bounded by geographical limits to particular countries or communities. Human society is broader than in the Middle Ages, and the world tendency is toward one state or one human society. The ideals of spiritual communism, according to Śrīmad-Bhāgavatam, are based more or less on the oneness of the entire human society, nay, of the entire energy of living beings. The need is felt by great thinkers to make this a successful ideology. Śrīmad-Bhāgavatam will fill this need in human society. It begins, therefore, with the aphorism of Vedānta philosophy janmādy asya yataḥ to establish the ideal of a common cause. Human society, at the present moment, is not in the darkness of oblivion. It has made rapid progress in the field of material comforts, education and economic development throughout the entire world. But there is a pinprick somewhere in the social body at large, and therefore there are large-scale quarrels, even over less important issues. There is need of a clue as to how humanity can become one in peace, friendship and prosperity with a common cause. Śrīmad-Bhāgavatam will fill this need, for it is a cultural presentation for the re-spiritualization of the entire human society. Śrīmad-Bhāgavatam should be introduced also in the schools and colleges, for it is recommended by the great student-devotee Prahlāda Mahārāja in order to change the demoniac face of society. 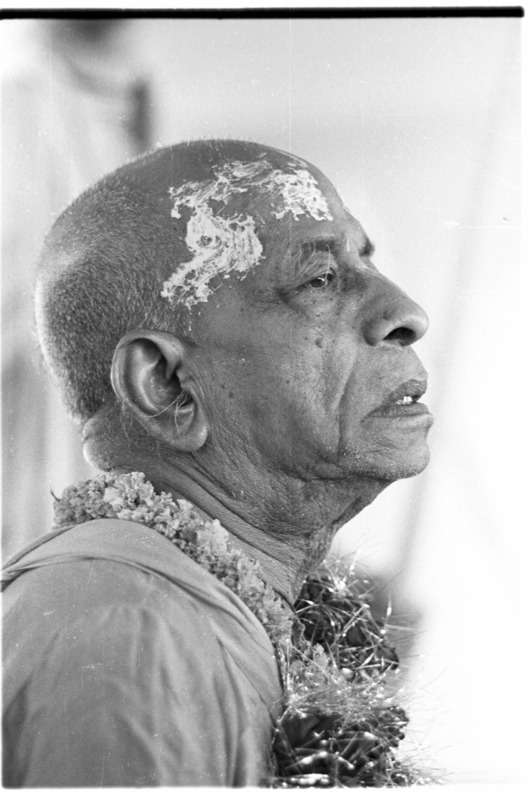 3… 2… 1… Jaya Prabhupāda!